The Kansas City area is rich in sports history. There have been national championship teams and championship title events. These sports arenas not only hold sporting events, but they also host concerts, conventions, expos, and several other events. Since arenas hold thousands of people, making sure the foundation and concrete floor are in proper condition is important. Over time, the concrete in arenas can deteriorate. The need to repair the deteriorated concrete is to protect the public and prevent the property from experiencing damage and failure. When these sports arenas are in need of concrete floor repair, looking for the least amount of disruption is important. Polyjacking.com has a fast, economical, and effective way to repair and level concrete floors in sports arenas in the Kansas City area. We use a polyurethane foam that is injected into a small hole and fills the voids under the concrete. After this foam is injected, it cures in approximately fifteen minutes and the concrete is ready to be used. There is little disruption and the arena is ready to host an event and people immediately. Choosing polyjacking for leveling the arena’s concrete floor over replacement decreases downtime and the project is completed in hours instead of days. 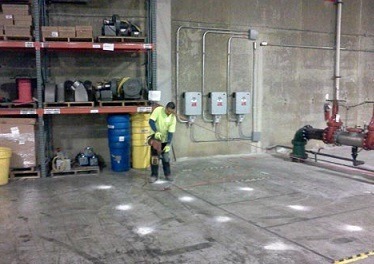 The polyurethane foam injection is superior over other concrete leveling methods. Polyurethane will never shrink. It has better structural integrity because the injection holes are only 5/8″ in diameter versus 3″ or larger for other concrete lifting methods, such as mudjacking. For the installation process, we use fewer poly trucks compared to mudjacking and other concrete lifting methods. Polyjacking.com is a licensed contractor, specializing in lifting and stabilizing concrete slabs. We welcome the opportunity to work with you on any municipal, commercial, industrial, or residential project in Kansas City.